You'd think that coming from two different companies and running two different versions of Android, the LG Optimus G and the Samsung Galaxy S III will be quite different. Well, they are not. The Galaxy S III runs Android 4.1 Jelly Bean with Samsung's latest TouchWiz customizations, which reach just about every corner of the UI. The Optimus G is on Android 4.0 Ice Cream Sandwich at the moment, but is waiting on an update to bring it to Jelly Bean. The Optimus UI tweaks are as far reaching as those of its competitor. Let's start with the lockscreens. Both phones offer more or less the same features, though Samsung offers two extra unlock methods (Face & voice and Motion) and can have a news ticker and weather info on the screen. The LG gives you a choice of clock style instead. When it comes to the homescreen, both phones let you have up to 7 panes that you can rearrange and pick which one is the default. The shortcut docks on the bottom fit 4 customizable shortcuts on the Galaxy S III and 3 on the Optimus G, but both phones fit only 4 icons on a row outside this dock. Widgets are resizable (this was introduced in ICS) and since it's running Jelly Bean, the Galaxy S III will move widgets out of the way when you re-order them. The Optimus G will do the same, despite running ICS, so LG has closed the gap here. The notification areas are similar and both feature connectivity toggles, but Samsung has picked the 5 it consider most useful and fixed them, while LG lets you pick which ones you want. A helpful trick on both phones is to long press a toggle, which brings out the Settings menu (e.g. GPS settings if you long-press the GPS toggle). Despite offering fewer toggles, the Galaxy S III manages to even the score here as its notification area has a brightness slider and (again, thanks to Jelly Bean) you can expand its notifications with a two-finger swipe. Something that both phones offer is a simpler launcher. Samsung calls it Easy mode and it's a preset with big, thumbable widgets. The cool thing about it is that Easy mode and the default (Basic mode) remember separate arrangements on the homescreen, so you can use one for work widgets and one for personal widgets and easily switch between the two. LG Optimus G does something else - it has an alternative launcher called Easy Home. It features a single widget on the first homescreen that shows weather and news from Yahoo! And a list of five contacts. The other homescreens are filled with all your app shortcuts - there is no app drawer, which makes Easy Home feel quite iOS-like. There's a shortcut dock at the bottom, which has three fixed shortcuts - Phone, Contacts and Message. We like LG's solution as it really is simple - the problem is few will buy a Snapdragon S4 Pro monster smartphone and feel the default launcher is too complicated? Samsung's solution adds no real simplicity, but you can use it as a makeshift way to keep work and personal screen setups (something like HTC's Scenes). 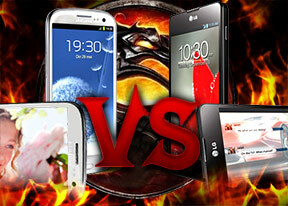 Both companies tried to make use of the processing power of their quad-core smartphones in several interesting ways. LG is quite proud of its QSlide feature - you activate it from the video player and it makes the video transparent, allowing you to use other apps, while watching them. You can adjust the transparency from a floating slider widget. We're not as excited about this feature as LG is, having two semi-transparent apps on the screen seems to make them both pretty hard to use. Samsung's solution, Pop up play, is slightly more usable - it just moves the video to a floating, resizable window that covers only part of the screen and you can move out of the way. QSlide can have a small video window too, but you can't move or resize it and it is always at least a little bit transparent. What we really would have liked to see here is the split-screen interface from the Note II. Another show of strength by Samsung is that the Video player app shows animated thumbnails - it gives you a better look at the video than a static thumb and ups the eye-candy quota. The Optimus G does have Dual Screen Dual Play though - when you hook it up to an external monitor with an MHL adapter, you can use the phone separately from what's playing on the screen (a video or a presentation). This way, you can show slides while reading your notes on the phone, or watch a movie and check IMDb for the name of that actor. The Galaxy S III has an MHL-enabled microUSB port too, but it just mirrors the phone's screen on the external monitor.